Set perfectly under the canopy of two mature maple trees and overlooking the reflecting waters of the lake, it is always a breathtaking moment when we are able to share this space. Extensive landscaping, bench style seating, grass walkway, courtyard and hand crafted arbor create this exceptional setting to frame such an important moment in your life. Built in 1814, this historic brownstone barn is truly impressive and unique to this estate alone. The raw beauty of this barn has been well preserved giving you an authentic space that is one of a kind. The soaring rafted ceilings and original post and beam framework are tastefully accented by vintage Edison lighting and chandeliers. The exposed stone walls create the most dramatic photographic opportunity, with lighting that can not be recreated. The elements of this barn, combined with the overall setting of the farm offer the perfect canvas to create the wedding of your dreams. 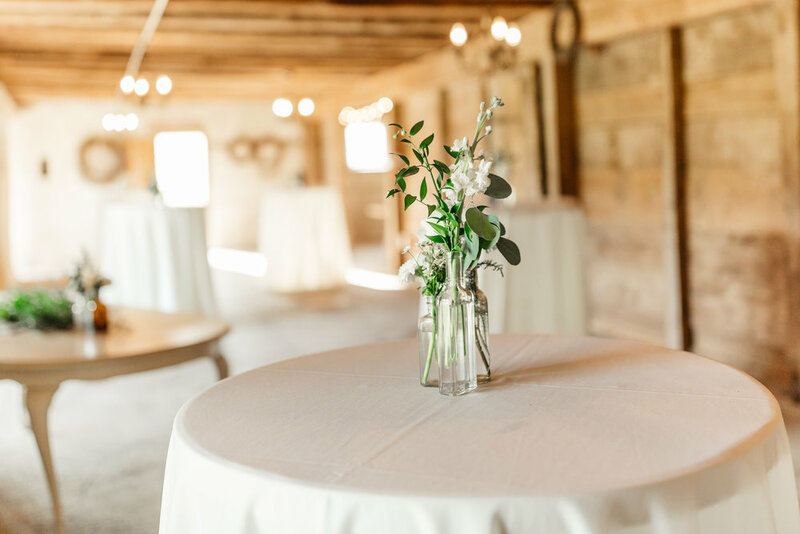 Our lower level barn and patio is the perfect setting for your guests to enjoy a cocktail reception. This organic space offers a glimpse into the history of this impressive barn. Hand hewn beams are accented by chandeliers and vintage lighting, creating an intimate atmosphere where the softness of even one stem of a flower can become such a graceful statement. The vintage lit patio provides endless views of the rolling pastures wilt the backdrop of the immense stone barn. Cocktail tables and rod iron seating encourage guests to mingle among themselves and enjoy the beautiful scenery of the farm. Pastoral and lush, the farm offers views that are unparalleled. From our private lake that greets you upon turning into the tree lined drive and continues around the property, to the fence lines that seem to go on and on, the setting is unlike any you will find. Extensive gardens and manicured landscape to the natural backdrop of field grasses and tree lines, the photographic opportunities are endless. This space was designed with you in mind. The bridal suite offers a private space for you to relax and immerse yourself in all of the preparations of the day. The neutral tones and modern farmhouse decor create a lovely photographic backdrop to document such a special time. The amenities include a full kitchen, bathroom, a sitting room and private dressing area. We invite you to spend your day here as you prepare to marry the one you love.